Arianna, Garrett, Kaylee, Dylanie, & Ethan are representing us in the district battle. Thanks to all our readers who participated! Thanks to all who entered. Keep on reading! 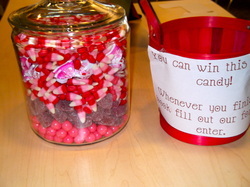 Read a book and fill out our form for a chance to win a jar full of candy. Battle of the Book Champions! The Glow in the Dark Bubbles were our champions. It was a close game against the Bibliophiles with a score of 65 to 57. Our champions represented Timberline at the district battle on Saturday March 29. Our 7 teams played in 6 games. We enjoyed a lot of great battles. Our top 4 teams were very close in their final scores. We look forward to some great teams next year! Some of our 8th grade students came to the library to recite the Gettysburg Address from memory. Fox 13 News came to the film the event. They put together a great story. The top 45 readers in the school (those who read the most books in their class) were invited to a special celebration during SSR on Wednesday May 22. 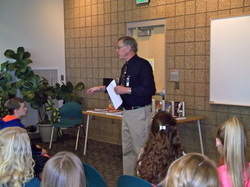 Gene Nelson, the Provo Library Director addressed the students and kindly brought books for the students. Some were even autographed copies. The students enjoyed some candy, donuts, and will yet enjoy a coupon to Chick-Fil-A. Way to go readers! For Valentine's Day we enjoyed many activities with chocolate: candy bar shuffleboard, guess the candy bar, pudding art, M&M sort, pie surprise, and Oreo stack. 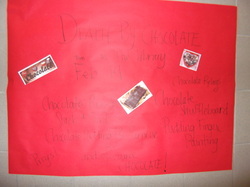 Prizes of chocolate were given to our winners! Join us for TRW after fall break. 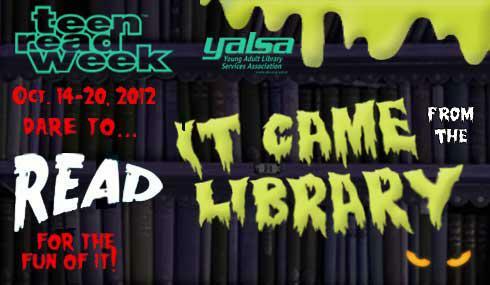 We'll have treats and fun activities! READ! READ! READ! Prizes for top readers in each grade and for the class that reads the most! We celebrated the opening of the Hunger Games movie with fun activities, trivia, and prizes. Students chose their district and tribute name, competed against the teachers in the cornucopia challenge, and tried their skills with a crossbow and dart gun.